Today we’re celebrating an important milestone in our business. ANA Nursing is 20 years old. Over the last two decades we have come a very, very long way to become one of London’s leading and most respected care companies and with the amount of competition out there these days that’s a significant achievement. 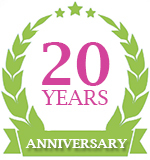 Twenty years ago the first branch of ANA Nursing was established – a tiny serviced office with one director and a coordinator. From this small start our business has grown to be four offices, 14 management staff and over 150 carers strong. Much has changed since those early days, but what has remained the same is our commitment to quality of care – a commitment that every member of staff we choose to work with us is tasked with reflecting every single day with every single person we’re entrusted to care for. I’m told by our finance team that our business has grown by 3,000% in that time, but no matter how big we’ve become we have held steadfast to the philosophy that every staff member should be treated as family, and every client as king or queen. Beyond offices, staff and client numbers, other significant changes have taken place over the years. Back in 1996 the business was launched to offer care staff to care and nursing homes; in 2006 the business came under new management and its focus started to change. By 2007 ANA Nursing had started a Domiciliary Care division to care for people in their own homes, and in 2012 we started working on significant local authority contracts as well. Today we work with Barnet, Brent, Islington, Camden, and Sutton local authorities and offer a wide range of domiciliary care, respite care, nursing care, live-in care, young adult care, personal care and end of life care. We specialise in caring for those with dementia and Parkinson’s disease, as well as those with palliative needs. We still supply the very best reliable staff in the industry to nursing homes. And our CEO has been elected to the board of the UKHCA, the UK’s leading home care professional association. As we pass our 20-year milestone we’d like to say a massive thank you to every single person who has helped us along the way, our staff for their dedication and team spirit, and our customers who have trusted us with their care and the care of those they love. Without you we could not possibly have reached the big ‘two-o’. The future looks bright. We’re researching new branches and new local authority contracts, we’re expanding our home care division to the forefront of our business, and as always, we’re on the lookout for the right sort of people to come to work for us, to join the ANA Nursing family and share our joy of helping others. Thank you all, and Happy Birthday to us!